blackberry picking down the back of the lanes. There were jams, chutneys and endless pies, crumbles, sponges; wonderful things for dessert. We have only just moved in and although I am sat dreaming of the fruits we might have next Harvest, we are fortunate to have a wonderful blackberry patch just round the beck way. 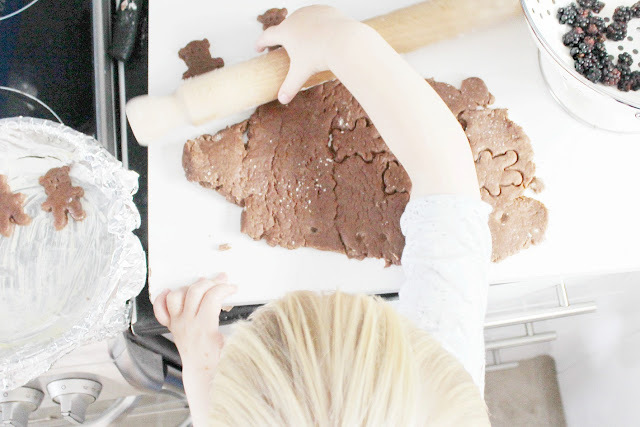 It was only when moving, I discovered we had a bear shaped cookie cutter - and decided to put it to use! 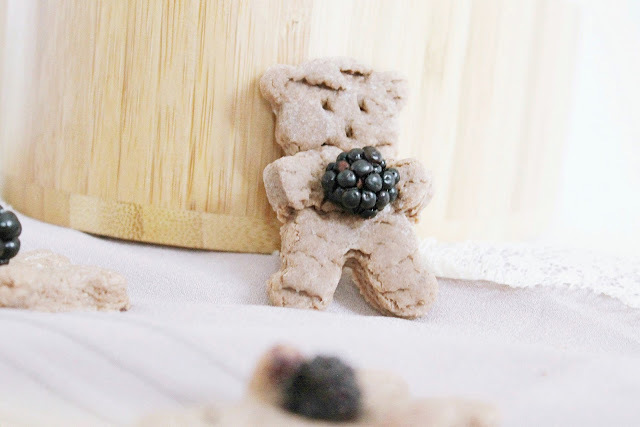 I had heard about the nut holding bear biscuits and decided to make a twist on them, using blackberries together with chocolate dough. They taste a cross between shortbread and bourbons, the blackberries go beautifully! We experimented a little. When you cook the blackberries in the oven they shrivel slightly, but are more likely to stick. 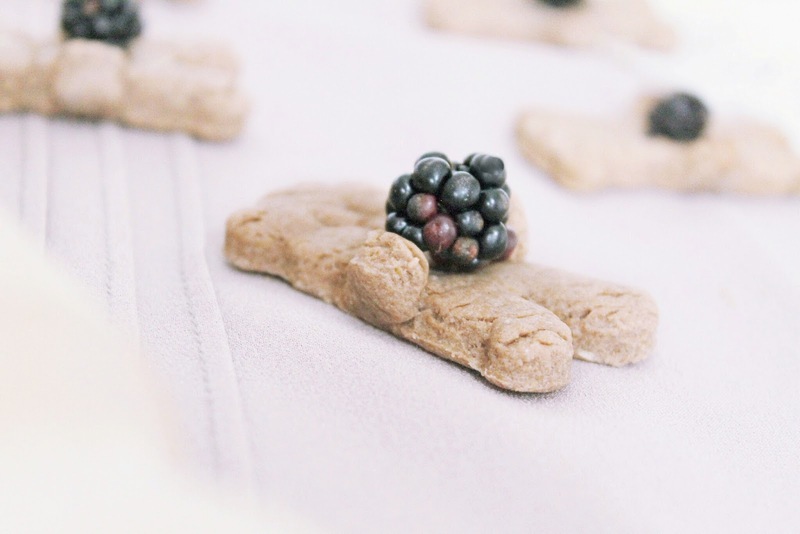 But more often it was easier to press the bears' paws together so that they might stay in place while cooking, and apply the blackberries after, with a little dab of chocolate icing. For the first time, Oscar was involved throughout the whole process! He adored picking the blackberries and didn't even mind the brambles and thorns, pushing them aside squeezing in to small places where only a child might fit. Of course, that's where the juicy ones hide! He pulled his chair to the kitchen side and had fun poking holes in the dough and sneaking bits when we weren't looking. Funnily he kept saying 'dough-nut'! Pre heating the oven to about 180 degrees, begin by beating the butter and sugar together for a few minutes until light in colour and smooth and creamy. Sift all the dry ingredients together in a separate bowl to remove any lumps. Beat the egg until it is thick and light and gradually stir in the egg and dry ingredients in to the main mixture, kneading it until it forms a dough. 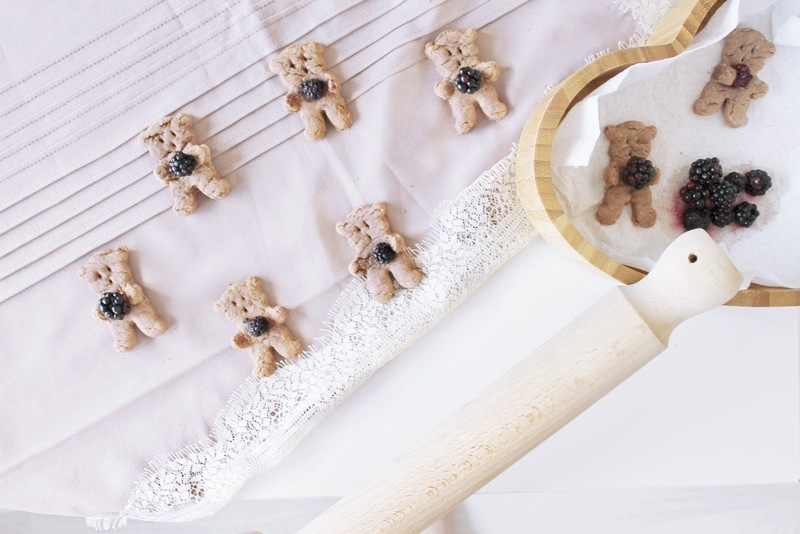 Use a rolling pin to flatten it to about one or so centimetres thick, then use your cookie cutter to press out little bear shapes, folding and pressing their paws together. Pop them on the baking tray and in to the oven! Set a timer for about 7-10 mins and keep an eye on them so they don't burn. Meanwhile, prepare your blackberries by giving them a lovely wash in the sink! Dry them carefully with kitchen towel and use a little dab of chocolate icing to secure them in place on the biscuit. Omg I really love your blog girl. So cozy.This recipe is amazing. I'm hungry right now. Wow, amazing, look so sweet and really cute! lovely! Must try it! Thanks for sharing! Wow, it super cute! Love your blog and amazing photos dear! 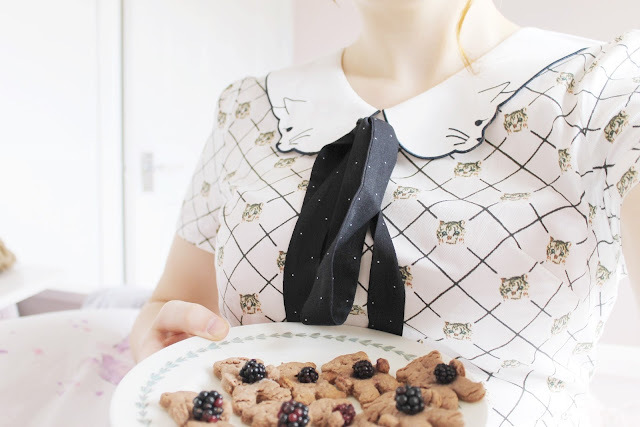 These are so cute, I don't think I'd be able to eat them haha. Love your blog! These cookies are sooooo cute. I don't usually bake at home but buy cookies and enjoy them a lot. :-) Such pretty pictures love it! This is adorable. 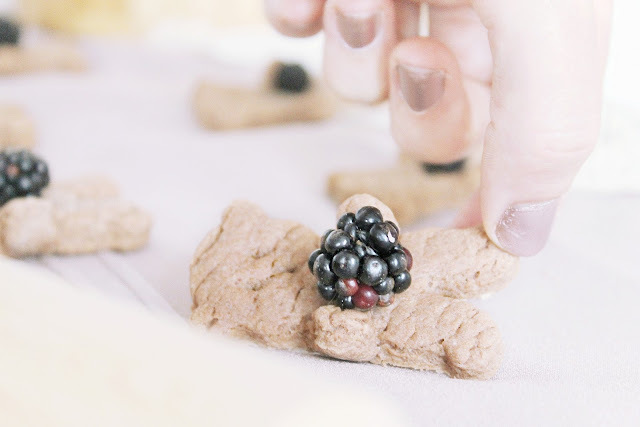 I love how they're paws are slightly curled so they're holding the berry! These cookies are just too cute! <3 I'm in love with your blog! Followed. 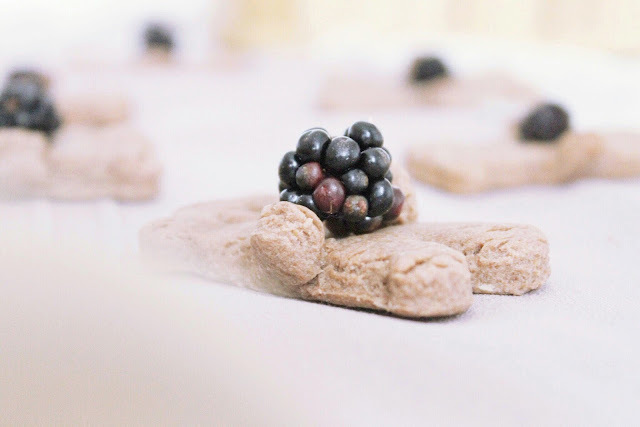 These are the sweetest looking little biscuits, I've added them to my baking bookmark! These are insanely adorable. Look tasty, too! These are utterly adorable!! I love your dress too. So sweet. These are so cute! I love your creativity. So sweet Oscar could be involved throughout too. I love your top!